The Gospel According to Thomas Jefferson, Charles Dickens and Count Leo Tolstoy: Discord is not what you might call an accessible title, but it does sum up Scott Carter's play quite neatly. In an unspecified afterlife that looks like a plain old room with a table and three chairs, three great men ponder why they're there, if there is a God (or a Holy Trinity) and what the Word of God really means. Each of them, we're told, fashioned his own Bible in his time. Stuck together, they have a great deal of trouble -- or discord -- putting their deeply held beliefs together into some sort of Gospel. As a Los Angeles Times reviewer put it, this play is "the dramaturgical love-child of 'Steve Allen’s Meeting of Minds' and Jean-Paul Sartre’s 'No Exit.'" Given the idea at the center of Discord, it's hard not to think of Meeting of Minds, the talk show on PBS in the late 70s and early 80s that put together panels of actors playing historical figures. On any given episode, you'd find folks like Attila the Hun, Emily Dickinson and Galileo pulling up chairs, with their discussion guided (and kept entertaining) by host Steve Allen. Scott Carter has given Discord that same feel and energy, with a lot more at stake for the trio he's trapped in Purgatory. They're not just having a chat, they're trying to find a way out. And in the end, faith, truth, fame, fortune, hypocrisy... They're all on the table. As Dickens, Jefferson and Tolstoy attempt to create a version of the Gospels that works for all three of them, they fall into discord and disagreement right from the start. They can't even agree on what the fundamental basis of God's creation is. Dickens says it's all about the Word, while Jefferson falls on the side of reason and Tolstoy dismisses them both, passionately arguing on behalf of the spirit. By the time each has stated his position, Tolstoy is down to only three words left of the entire Bible. That all may sound talky or dry, but Carter's script has plenty of spark as it plays out in Urbana's Station Theatre. Director Lindsey Gates-Markel and some helpful captions from lighting designer Jesse Folks define the action nicely, and actors Gary Ambler, David Barkley and Steven M. Keen succeed in creating distinct, pithy portraits of three very different men. Keen's Jefferson is more formal and analytical, Ambler's Dickens is expressive and showy, and Barkley's Tolstoy is overflowing with earthy intensity. If each represents an idea, they're also men when push comes to shove, with regrets, weaknesses and frailties. It's a neat trick to take something with very little plot and make it seem so active. Kudos to Gates-Markel and her talented cast for mining the conflict and the humor so well. 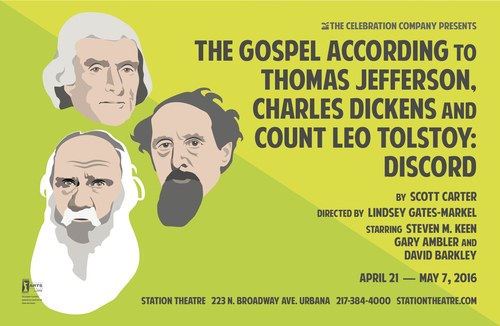 IMPORTANT NOTE: The original schedule for the Station Theatre's production of The Gospel According to Thomas Jefferson, Charles Dickens and Count Leo Tolstoy: Discord called for the show to finish up its run this week. The Station website and its reservation page now indicate that this week's shows have been pushed back two weeks and will take place on Wednesday May 18, Thursday May 19, Friday May 20 and Saturday May 21. Just to clarify: No shows this week. No shows next week. Shows May 18 to 21. If you would like to make a reservation for the newly scheduled week, please visit the Station's main page and click on "Make a Reservation" or call 217-384-4000 for their box office. HAPPY 117th BIRTHDAY, FRED ASTAIRE!